North facing and steep, Bolfracks is a challenge to garden. There has been a garden here for over 200 years. Owned by the same family since the 1920's, each generation has made their changes to it. 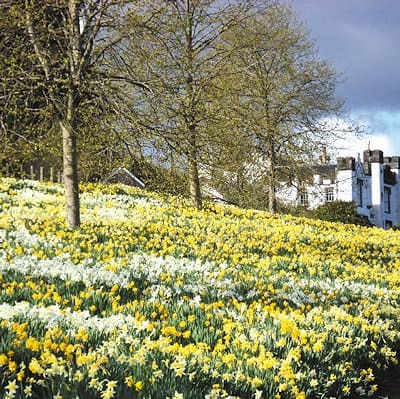 As you arrive you sweep up a long drive that in spring is just a stream of daffodils. An enticement to visit. The garden is divided into a woodland garden and a formal rose and herbaceous garden. The Woodland garden follows a burn up, where you see spring bulbs, Hellebores, Azaleas, Rhododendrons, Meconopsis, Gunnera, Lysichiton, Primula and followed by good autumn colours from the collection of specimen trees. There are wonderful views across the Tay Valley. The formal garden has a good selection of roses, clematis, Sorbus & Acers, herbaceous borders, peony and hosta beds. Bolfracks is a garden originally planted with love by the current owner's uncle. Recent years have seen some much needed changes and renovation by the present owners. As always, this is an ongoing process. Location: 2 miles west of Aberfeldy on A827 towards Loch Tay.